Blueberry Frenzy | Mommy Joys | Marriage, Motherhood, Life. To our close friends, Rolly and I are probably the epitome of cheesiness. *GRIN* But he's the cheesier one. And he likes blue. And strawberries. 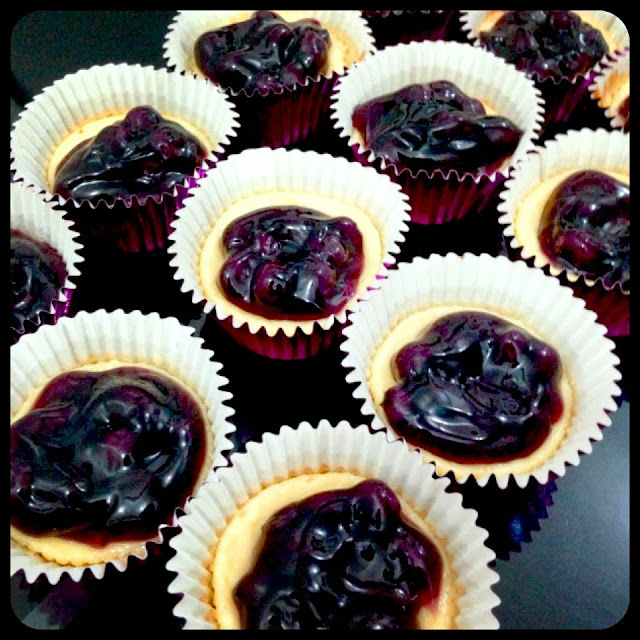 That's why I baked blue-berry-cheese cakes! It was Sunday last week. Rolly had been asking me to learn how to bake a blueberry cheesecake, so being the good wife that he thinks I am (haha), I researched for a newbie-friendly recipe that I could follow. I found one from talentadongchef.wordpress.com but adjusted it a little bit. And the result? The blueberry frenzy didn't end here. After my boss tried my cheesecake come Monday, she asked me to bake some for her daughter (who's very kagigil adorable by the way) who's celebrating her birthday the same week. 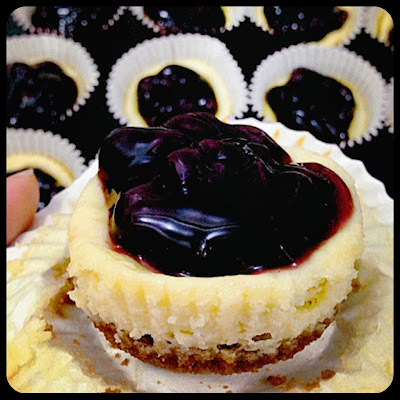 I felt extremely giddy because that only meant my cheesecakes were really good diba. Hehe. (Sorry I really had to say that =P). So I said yes without batting an eyelash! And then she said she needed 48 pieces. Waaah! Haha. That's too many and I felt scared and pressured, but there was no turning back. And it was for baby Anika anyway who's very close to my heart. Eventually, I willingly and happily took on the challenge. 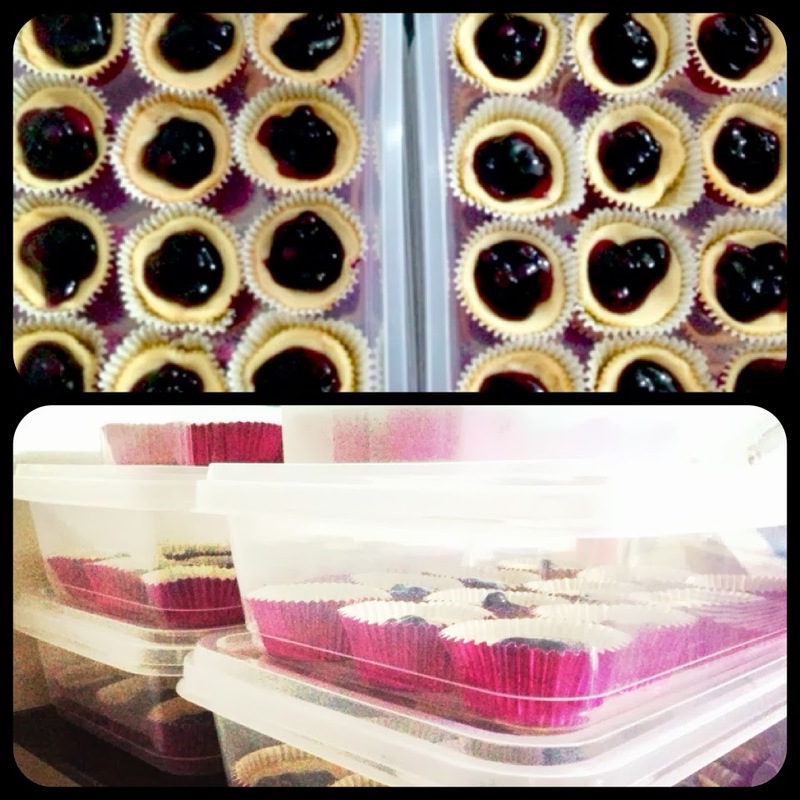 I realized the task was not at all easy as pie, especially since this was the first time I would be selling my cupcakes. Meaning, the "consumers" weren't my friends and family. In fact, these would be people who do not know me at all (baby Anika's party guests). There was pressure, yes, for the cupcakes to really taste good! Ang dami daming pumapasok sa isip ko as I was baking. =| But in the end, everything paid off. :) I even got a text from my boss after the party saying that no less than her daughter's school directress loved the cupcakes! She said they were tastefully done, literally and figuratively. Wooooow! I flew to seventh heaven!